When you find yourself watching an Asylum film, you have two options: set the bar low, or go wash the dishes. 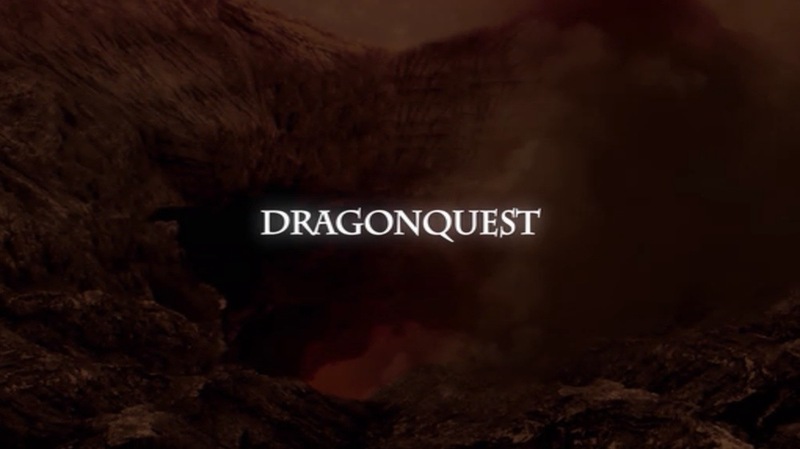 There was something fermenting under all the tableware in the sink, so I chose to keep watching “Dragonquest”. Besides, I’d been assured that the fantasy adventure contained a big damn spider for no damn reason. Technically, it’s more of a Dragon Field Trip. The movie opens with some long aerial shots of terrain, then settles on a ledge high on a barren cliff. Here, a hooded figure (Brian Thompson, recognizable to any fan of “The X-Files” as the alien bounty hunter) squeezes a large gem until blood pours out. His name is Kirill, and his ritual summons a crap CGI dragon made of crap CGI shadows. From this ominous beginning, the story shifts to an idyllic rustic village, where an idyllic young peeping tom uses a spyglass to see what an idyllic young maiden has under her blouse. Sadly, this sexual-predator in the rough is our hero. His name is Arkadi, and he lives with Grandfather, the kind of wise old man who always winds up watching over orphaned protagonists in hiding. He is not amused by Arkadi’s antics — chasing girls and smoking what appears to be fairy dust. The little pervert probably keeps Tinkerbell locked in a chest with his dirty scrolls. Sensing the coming of plot, Grandfather gives Arkadi an amulet. It’s very shiny for an artifact that has been hidden away, and it’s shaped like a cross between a knot and a honeycomb. Our hero is sent several inches away so that Grandfather may confer not at all secretly with another villager. It seems that Arkadi is destined to succeed where Grandfather has failed. We’re left to imagine that this most be something important, but not for long. The shadow dragon arrives and starts burning everything in sight. Grandfather, of course, dies sending the dragon away. He did manage to send his friend to warn the King. As for Arkadi, he is sent to find Maxim (about whom he knows nothing). The fate of the partially disrobed village girl is not known. Grandfather’s pal goes to the King’s castle and tells everyone he meets about Arkadi before admonishing them against telling anyone else. One of the King’s men promptly hies himself to Kirill to spill everything. There follows an epic battle between the forces of good and evil, represented by about five dudes taking turns falling down. Arkadi stumbles on this scene, and he talks briefly with the King before his majesty gets flambéd by Kirill’s dragon. In what becomes a recurring theme, Arkadi stumbles blindly away from the action. It is telling that some of the only dark-skinned actors in the movie are the bandits who jump Arkadi as he wanders toward his destiny1. It is also telling that the only reason for this attack is to introduce Katya, a warrior trained in the arts of applying make-up and fighting in corsets. She rescues Arkadi and leads him to Maxim — portrayed by Marc Singer as a growling land-pirate — who finally puts the plot train back on the rails. It seems that Maxim, Kirill, and Grandfather were all part of an organization called the Brotherhood. Their purpose is unclear, but it somehow involves continually hiding a bunch of gems that represent virtues and getting people to collect them again. Grandfather got all of them but one — humility — and apparently after some time limit was exceeded the gems were taken away from him and re-hidden. I’m speculating here, but no reason is ever given for why they all have to be found again. The amulet that was given to Arkadi is for turning the gems into one amazingly gaudy bauble. For some unclear reason, Grandfather believed that Arkadi was possessed of the necessary virtues to collect them all — meaning that there must be gems for lechery, laziness, and generally being a doofus. It’s hard to know for sure, as after an initial, rapid rundown most of the virtues are never again mentioned. Regardless, Arkadi is now the Keeper, and it’s his job to prevent the quaffle from passing through his goal hoops. Or to prove himself virtuous enough to create his own crap dragon, whichever. From here, the story settles into the titular quest, and we see Arkadi blunder from one pointless challenge to another as he wanders toward his inevitable, unearned victory. Typical of these challenges to his virtue is what I call the Challenge of Pretending There’s a Big Damn Spider. Arkadi has been sent off on his own while Maxim and Katya go somewhere else (hopefully to call their agents). Seeing a cave, our hero decides to poke around in it. 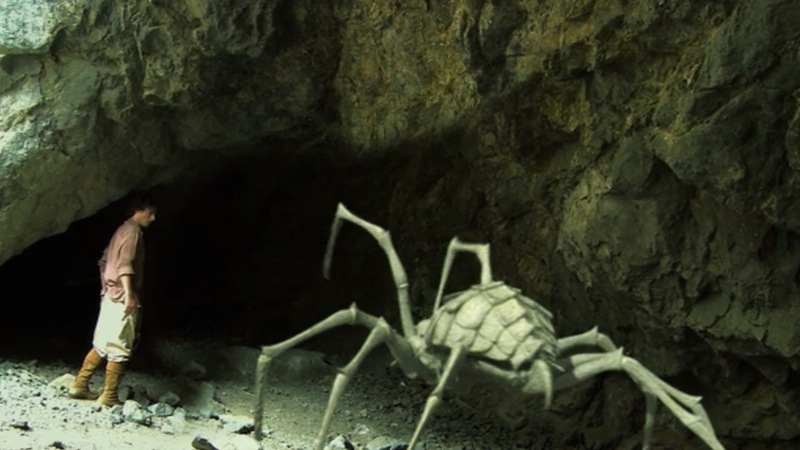 He finds himself in an improbably well-lit tunnel, where he stands as a giant spider saunters past him. Then he looks down and sees a gem. There may as well not have been a spider at all. Or a cave, really. Arkadi demonstrates the virtue of Invisibility to Arachnids. Every now and then you can see some slim connection to a virtue (chastity, represented by not immediately rubbing parts with a stranger), but none of it is particularly challenging or proves much of anything unusual in his character. That’s the really frustrating thing about the movie; Arkadi’s rewards feel like prizes for participation, not a proof of his superior inner qualities. Asylum has a reputation for churning out low-budget genre films with generic plots and slumming B-list actors. The surprising thing about “Dragonquest” is that the familiar fantasy elements are thrown together into a completely incoherent mess. Nothing fits together except for the constant refrain of collecting the Stones of Virtue, which activity is so random and non-challenging as to suggest divine intervention. That could explain why the spider’s legs disappear at certain points in its ambling. Or maybe it’s just that nobody really cared enough to put forth any kind of effort for an Asylum feature. It was awfully nice of Kirill to wait until Arkadi got the amulet before launching his attack. I honestly couldn’t tell if the King put himself out of his misery or stabbed at the dragon as he burned to death. I need to watch a good movie soon. Unsurprisingly, this is the first screen-writing credit for both of the writers, Brian Brinkman and Micho Rutare. 1. If the only black actors in your modern movie are bandits, you should probably take a sensitivity course. I mean, yay for breaking up the blinding glare of paleness, but would it kill you to spread people around?